2014 marks the 35th anniversary of the founding of Euroricambi. 35 years ago, Orazio and Marisa Taddei started the Euroricambi adventure. From the modest beginnings and weathering several economic recessions, Euroricambi continued to grow and evolve constantly. Times have changed, but adapting to new business environments and facing new and dramatic challenges did not change our historical principles: offer highest quality parts, immediately available to our customers, at affordable prices and granting an excellent 360� service to the aftermarket. The work of Orazio and Marisa Taddei in the world of gears begins in 1967, and after more than 10 years of experience, in 1979 they create Euroricambi. The product offered is a natural response to the markets� starting demand for reliable but affordable replacement parts. It all starts with a staff of 5 people in a building of 1,000 square metres, making steering parts suitable to Fiat, screws and bolts. In the early 80s, Euroricambi starts pioneering out of Italy and exploring new markets, the first area manager is hired. The product range is diversified, our first catalogues showing transmission parts are published. In the late 80s, the product range offered is largely increased, and the company with its 30 employees is now located in larger premises, 2 buildings of 3500 square metres. In the 90s, with the continuously growing range of spare parts, Orazio and Marisa Taddei�s priority is the immediate stock availability for our customers. The choices made lead to new important investments, and Euroricambi boosts once more: in 1995 the new headquarters are inaugurated, by now 4 buildings for a total of 13.500 square metres which host the production facilities, a large stock and 120 employees. In 1997, Eurotec, exclusive distributor of Euroricambi products in Italy, is founded. The new millennium does not stop Euroricambi�s growth: in 2002, operations start in the two new workshops of 5.642 sqm with a state of the art machining equipment, and since 2009 we are proud to serve our customers from our newly built logistic premises, 9.127 sqm of covered surface with an innovative warehouse. In 2010, A.M. Gears is founded, taking over the historical Antonio Masiero brand: since 1954 present in the spare parts market, the AM Gears products integrate the offer of Euroricambi. The managerial cohesion between the charter members Orazio and Marisa Taddei, and the new generation, allowed the continuation of tradition following the principles and historical values of the company and, in the same time, the commitment of their daughter Patrizia and their son Pierluigi consents to renew and strengthen the future of the company. Today our FA.TA SPA group with its staff of more than 700 employees, 6 companies hosted in 14 buildings with a total of 53.980 square metres covered, pools all the companies of the Taddei family, and wishes to say a special THANK YOU to our customers, our employees and our suppliers: all of them a �gear� without which our Euroricambi �transmission� would not have started to move at all. 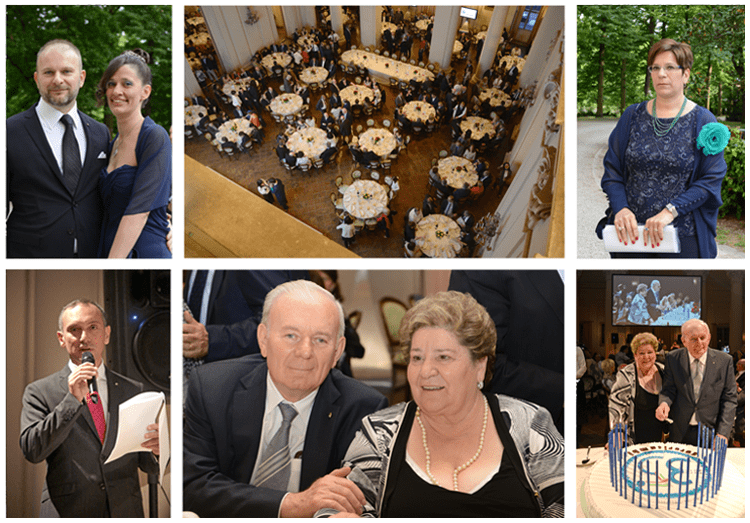 PS: continue to visit to our news section � shortly you may discover how we are going to celebrate, together with you, the 35� anniversary of Euroricambi!